Homeschooling 3: Managing Your Home Review, Giveaway and Freebie! Managing Your Home Review, Giveaway and Freebie! Do you remember a few months ago I reviewed a wonderful Music Appreciation course, Beethoven Who? Family Fun with Music? 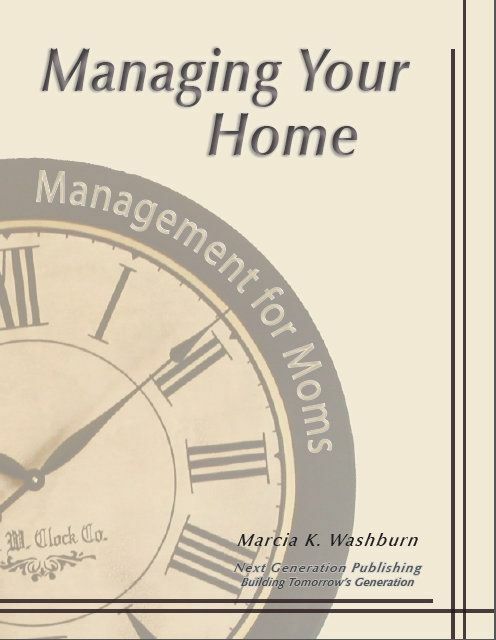 Well, the author, Marcia Washburn, has also written a fabulous ebook, Managing Your Home, and I am thrilled to introduce it to you! Managing Your Home is just one of three titles available in the series Management for Moms. There are three additional titles scheduled to be published next year! What is Managing Your Home? It is a 55 page ebook written for the busy homeschooling mother to more efficiently accomplish the duties of the home -from housekeeping and laundry to grocery shopping and even tips for keeping the car tidy - complete with necessary items, too. And this is what I love most about Marcia ~ she openly shares her failures and what she's learned through them to help us. This ebook is full of practical advice and examples straight from the Washburn household, along with many Biblical quotes and even devotional material of sorts. I consider this a true Titus 2 ministry she has developed and shared with us! I've already begun to implement Keepers, Leapers, and Creepers (a way to deal with clutter and organize). I still have a long way to go, but her unique way of looking at the situation makes total sense! Pricing, a fabulous special discount, a giveaway, and freebie! Currently, Marcia is running a special on the three of the Management for Moms books she’s released so far. You may purchase all three ebooks (Managing Your Home, Managing Your Children and Managing Your Family’s Finances) for only $9.99 from now until Dec. 16th. That is a savings of over 33%! You may purchase Managing Your Home separately for $4.99 here. If you chose the bundle, you may purchase all three here. Also, Marcia is offering a copy of Managing Your Home as a giveaway! If you have already ordered a copy (either singly or as a bundle with the others in the series), and you are selected as the winner, Marcia will refund your purchase price. So there is no risk! ~ You may enter the giveaway through Rafflecopter at the end of this post. And now let me tell you about a wonderful freebie Marcia is offering! Anyone who requests it may have a free copy of her article Mommy Tips, excerpted from Managing Your Children, just for the asking. You may email Marcia at marcia@marciawashburn.com. Be sure to look for Marcia on facebook (click this link), too! I love my family to pieces but I fail in many areas when it comes to managing the home. This is a book that I wish was in softcover. I would have highlights and notes scribbled everywhere! ~ In fact, I plan to send this ebook over to an office supply store to print and bind. I have no doubt that a happy, economical, and well-run home will be the result if even a fraction of her advice and tips are followed. Marcia is uplifting and encouraging as she shares her secrets to making a home run smoothly. I am thankful for the wise counsel Marcia has shared through Managing the Home. I am also excited and hopeful about implementing more of her practical tips in my own home. Disclaimer: I was given a copy of Managing Your Home ebook in exchange for an honest review. This looks like an encouraging resource. Printing it sounds like a great idea. Oh I could use some help here! This sounds wonderful, and needed. I'd love to win -- sometimes I think I need all the help I can find. If its written by Marcia its bound to be great!